The behemoth Arizona product Deandre Ayton has surely not lacked hype or debate throughout his lone college basketball season at Arizona. Ayton standing 7’0″ plus with a 7’5″ wingspan equipped with high levels of athleticism has the look similar to other star Centers, namely, Shaquille O’Neal, Joel Embiid, etc. In addition to promising physical attributes, Deandre Ayton averaged over a double-double in 33.5 minutes per game at 20.4 PTS and 11.6 rebounds per game his freshmen season. This is some good company. Not only does Deandre Ayton have high upside at the center position, he also has a high floor; the typical traits one looks for in any draft prospect, let alone the potential top pick. Ayton’s Similarity Scores also look fairly promising, comparing stylistically to bigs with strong rebounding ability and some touch from the perimeter albeit more in the mid-range. The double-double monster that is Deandre Ayton had offensive and defensive rebounding percentages of 13.5% and 28.2% last season which puts him in a category with the likes of Kenneth Faried, Joel Embiid, Domantas Sabonis, John Collins, and more. While less glamorous, rebounding is still a part of basketball and rebounding percentage does have some predictive power. 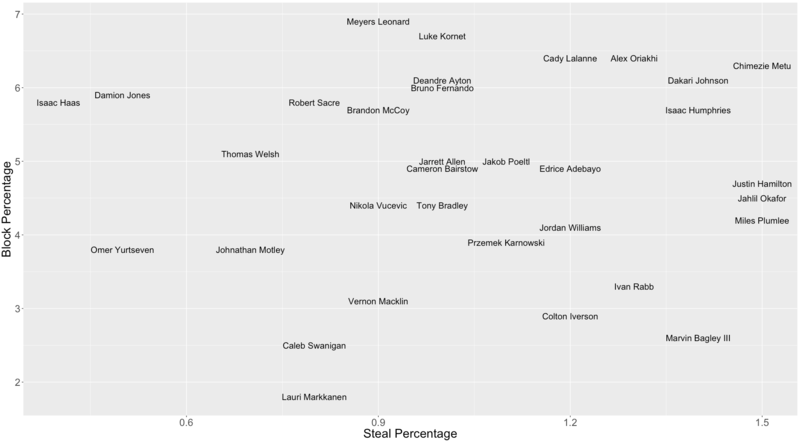 In order to give perspective, a couple of players with lower defensive rebounding percentages (in the 14-17% range): Jahlil Okafor, Lauri Markkanen, Ryan Kelly, Diamond Stone, etc. who unequivocally have struggled to rebound and, interestingly, to defend in the NBA (save for maybe Lauri Markkanen). Considering Ayton played with another seven-footer, his defensive rebounding percentage is more impressive. Now, offensively, simply put, Ayton destroyed the rim. Over 50% of his attempts and makes were at the rim, where he converted at a rate of 79.7% finishing in the 93rd percentile for bigs, according to Will Schreefer. Ayton also demonstrated some touch in his game. He shot 35 threes converting on 12 (34.3%), although he went 3 for 17 on NBA threes, according to Will Schreefer. Ayton’s free throw percentage of 73.3% on 191 attempts indicates he might have decent touch. Although our Models don’t project Ayton to be a knockdown shooter in the NBA, he does project to have some range. Finding a good defender within this list is a difficult task. Of the 33 players listed, only 6 had a reported wingspan of 7’5″ or greater, including Deandre Ayton, Jahlil Okafor, and Cody Lalanne to name a few. Given the historical data, it’s hard to project Ayton as anything better than an average rim protector and more than likely a below average one. Deandre Ayton projects as a dominant offensive and rebounding center with some touch and playmaking ability. Although 7’0″+ tall, Ayton will likely struggle on the defensive end at the NBA level. While our Draft Models indicate we shouldn’t think twice about drafting the big man out of Arizona, one must also consider the value of a poor defensive big man in today’s NBA, or, more importantly, an NBA 5 years from now. For reference, consider the top 5 centers by Real Plus-Minus in the 2017-18 season: Nikola Jokic, Anthony Davis, Joel Embiid, Karl-Anthony Towns, and Rudy Gobert. All possess some combination of elite playmaking, shooting, and/or defense, none of which Deandre Ayton would likely be considered elite in. 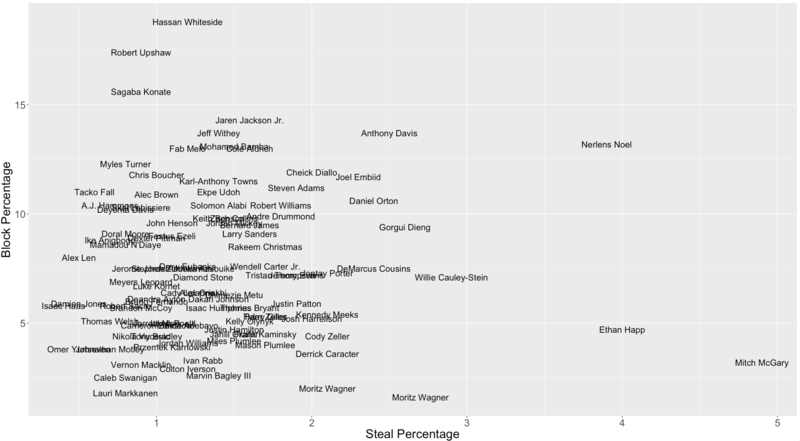 Additionally, the college basketball players in the historical top 5 of Real Plus-Minus, i.e., Davis, Embiid, Towns, all posted block percentages and defensive box plus minus greater than 11% and 10, respectively, in their lone college season. Point being that in an NBA where Joel Embiid struggles to stay on the floor against certain lineups, it’s tough to center your franchise on a lesser Embiid type prospect, if Ayton is that at all.